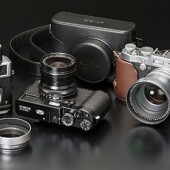 The online retailer Crutchfield has listed the Fujifilm X100 camera as discontinued on their website. At the same time the price of the X100 dropped to $999 on Amazon. I am pretty confident that we will see a new X200 announced at Photokina this September (the X100 was announced during Photokina 2010). The FujiGuys just posted this cryptic tweet about something exciting coming from Fuji in Fall ’11. Fuji S6 maybe? I’m all ears!